There has to be some compensation for the disappearance of summer and the sunshine, but the abundance of beautiful autumn fruits, vegetables, and berries do an excellent job! From September onwards it is possible to pick from fruits including sloes, bilberries, plums, pumpkins, wild mushrooms, and fat juicy blackberries. 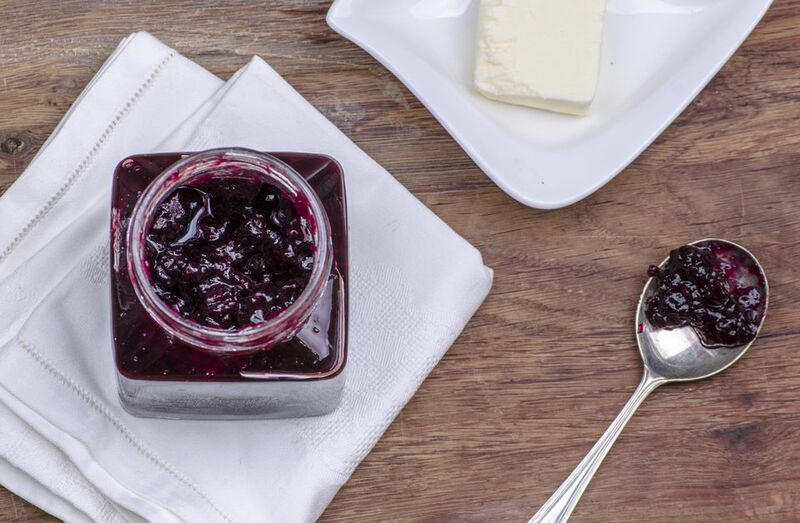 Blackberries are perfect for making a blackberry jelly, a delicious jelly to serve at an afternoon tea or as an accompaniment to cooked meats and game. The recipe below uses cooking apples and these add not just flavor, but also deliver a hefty amount of pectin. Pectin is a starch (a heteropolysaccharide) which, when cooked with an acid and sugar, forms a gel—hence its use in jam and jelly making! Take a tea towel or jelly bag and wash in boiling water (the tea towels may be tainted with food or detergent smells and these can spoil the jelly). Leave to dry. Suspend the tea towel or jelly bag on an up-turned stool with a large bowl underneath for the juice to drip through unless you are lucky enough to have a jelly bag stand. Place the blackberries, apple, water, and lemon juice in a preserving or large, heavy-based saucepan that is big enough to hold both fruit and sugar. Bring the fruit to a boil and simmer for 20 mins or until the fruit is soft. Avoid stirring as this will damage the fruit. Gently place the fruit and juice into the jelly bag or tea towel and leave to drip overnight. Do not be tempted to squeeze the bag at any time as this will make the jelly cloudy. Measure the juice; for every 2 1/2 cups of juice weigh 1lb. of sugar. Place the juice and sugar into a preserving pan and stir until all the sugar has dissolved. Bring to a boil and simmer for 10 to 15 mins or until setting point is reached (see note below). Clear away any scum from time to time. Fill clean, sterilized jars with the hot liquid, cover, seal, and store in a cool, dark place. To test for setting: Place a small plate or saucer in to the fridge for 15 mins. Pour a spoonful of the hot jelly onto the plate and return to the fridge for 5 minutes. Push the edges of the jelly with your index finger—it is set when it gets wrinkly and crinkly to the touch.